"We'd like to carry on....I think? Not really sure here....I'd like to carry on, certainly....definitely..." - Paul McCartney, Candlestick Park, 1966. Those words from Paul just before the final two songs of the concert at the Baseball stadium Candlestick Park located in the soon to be hippie paradise San Francisco, California would turn out to be prophetic. Although nobody could hear them over their own screams, the Beatles final show of their North American tour of 1966 would turn out to be their last ever tour and announced live appearance. 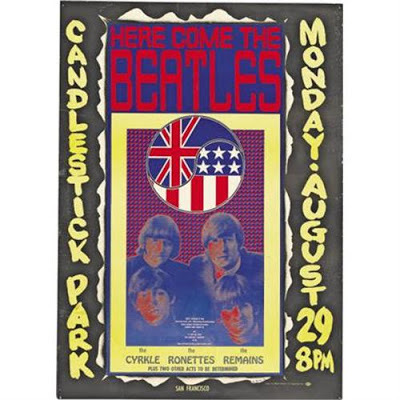 It was sort of known among the Beatles and their entourage that it was going to be the last show. Just before they began playing, John Lennon took a camera on stage and snapped pictures of the other Beatles and himself at arms length and Paul McCartney asked their press officer Tony Barrow to make a tape recording of the concert. Coming Out of Left Field: The Beatles give their final concert at Candlestick, but not a single fan knew at the time this would be the final time the band would appear live in America. The concert itself was the usual of the tour. They played a total of 11 songs, probably which only snatches were heard due to the screams. The park wasn't even full either; of a 42,000 capacity only 25,000 tickets were sold. This seems unbelievable today to Beatles fans who missed out on the chance to see them either because they were too young to go or wouldn't be born for years but at the time, it was a reflection of what was happening. The Beatles had opened the floodgates for the British music invasion of the USA. 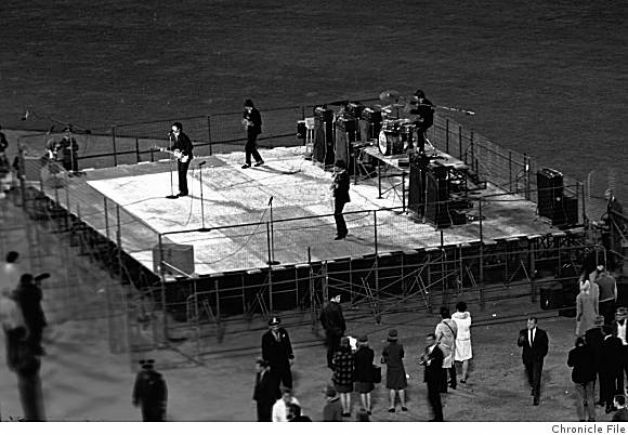 The way i see it, this sorted the proverbial wheat from the chaff of Beatles fans; the 25,000 who turned up were real fans and hadn't just jumped on the bandwagon in 1964. We Can't Hear You: The Beatles had finally got tired of nobody listening to them at their concerts. John and Paul brought a camera on stage to take photos of each of the band to document this historic event. After the last number, which was 'Long Tall Sally' instead of 'I'm Down', Paul, George & Ringo bounded off the stage. John lingered a little longer and played the opening notes of 'In My Life' which nobody probably heard and, sadly, isn't on the tape recorded by Tony Barrow as the tape ran out during 'Long Tall Sally'. John quit playing and ran to catch up with his band mates who were piling into the armoured car which would take them straight to the airport where they'd board a plane bound for Los Angeles. "That's it then. I'm not a Beatle anymore." George announced on the plane. 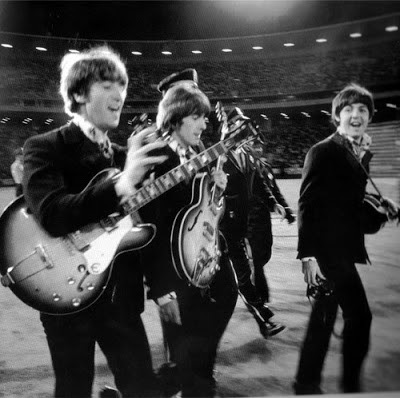 Live performance had dominated the Beatles career for the last 6 years and had only got more and more intense the harder they chased their collective dream of being famous. Everything they did was sandwiched between concert appearances, even recording sessions. Now there would be no more concert appearances, no more live Beatles. The Last Time: John, Paul & George walk towards the stage for the last time in the USA. Note the camera Paul is carrying to document the occasion.